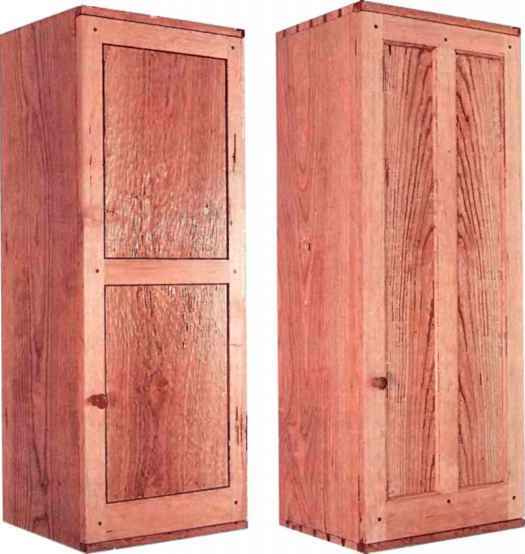 The most obvious feature of many wall cabinets, kitchen cabinets or even freestanding cabinets is the doors. By changing the style ofthe door, you can subtly or significantly alter the appearance ofthe cabinet, as 1 found on a re-centjob when ] ended up making five different doors for the same carcase. 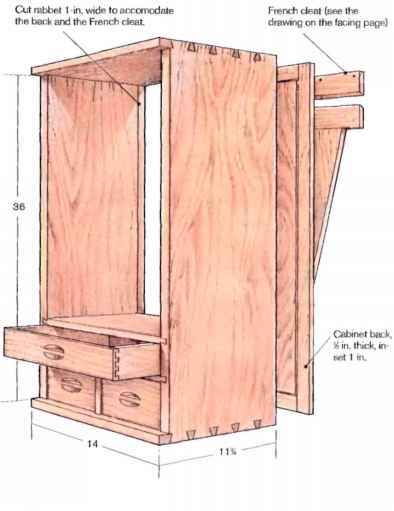 wanted to design a simple wall cabinet that mounts on a hidden hanger (see the sidebar on p. 80) and that would function in a variety of settings. ] started with a basic box for the carcase, as shown in the drawing on p. 81, with the idea ofmaking the door the main attraction. DOORS CAN SIGNIFICANTLY AFFECT the appearance of a cabinet. A simple frame and flat panel are perfect for showing off the wildly flame-figured panel of this door. HAND-CARVED PANELS CREATE an interesting textural effect in an otherwise plain door. Dividing the door horizontally makes the cabinet look shorter and wider. 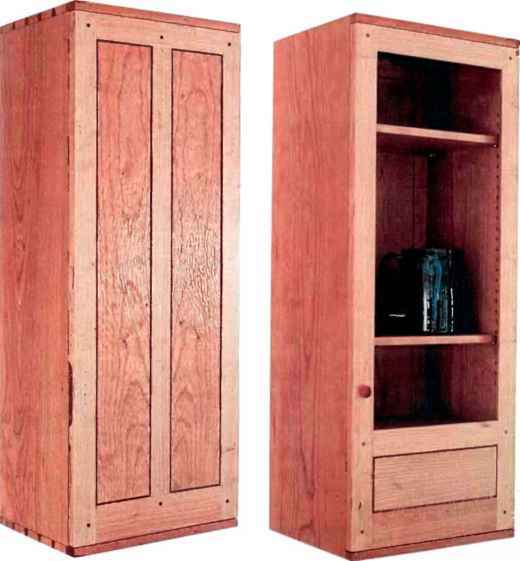 A VERTICAL CENTER STILE and thin, recessed panels give this cabinet a tall, narrow appearance. 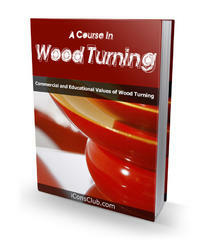 Quarter-round moldings are an easily added detail. shown in the photo on p. 77.The simple frame-and-panel construction was the perfect showcase for this magnificent piece of wood. As I stood admiring my handiwork, I began to wonder, what if... ? One idea led to another, and soon 1 was at work on door number two. For this door, 1 decided to divide it horizontally with a center rad, yielding two stacked, flat-flush panels.The results were okay, but compared to the incredible figure in the first door, door number two seemed rather plain. It needed something to set it apart. After a hltle midnight inspiration, I took a carving gouge to the panels and textured their front faces, as shown in the left photo below.This was a simple but time-consuming process that required some care and a sharp gouge, especially around the edges to avoid tearout.The oiled, carved facets gave the panels a nice three-dimensional look, but 1 couldn't help wondering iflhe door might not look better divided vertically. more complicated joinery to assemble the door frames. Door number four was a combination of doors two and three. 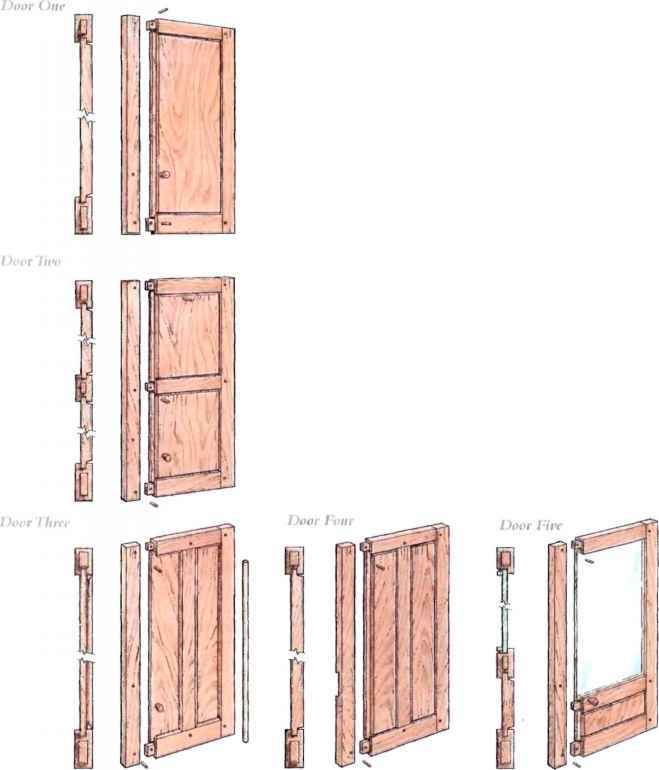 Door four had vertical panels as in door three, but the panels were flat, flush and carved as in door two. 1 really liked the tall, thin, clean lines of this door, as shown in the left photo below.To accentuate the look, 1 did away with the knob and routed a finger pull on the edge of the door frame. This was my favorite door so far, but what if...? To give the piece a bit more versatility, 1 decided to make one last door. Door number five is glass paneled to serve as a display cabinet. A single piece of glass set in the mortised-and-tenoned frame provides an unobstructed view ofthe cabinet's contents, as shown in the right photo below. A small, quartersawn, horizontal panel at the bottom of the door covers three drawers. Carved pulls recessed in drawer fronts maximize interior drawer space. At this point, 1 decided to stop making doors. Although 1 hadn't yet made the standard raised-panel or gotten into complex carved lattices, end-gram or stained-glass panels, 1 now had four more carcases to build for my door collection. One has to quit somewhere. 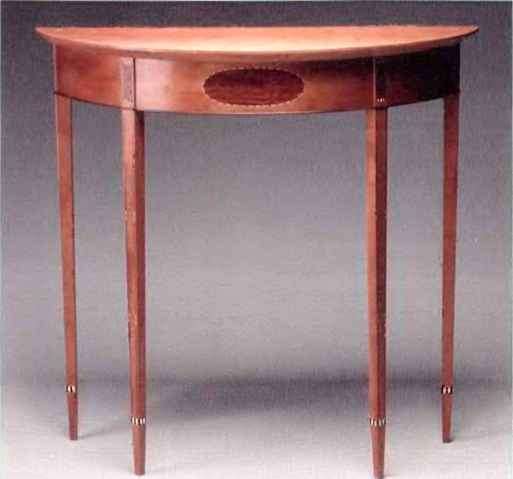 CHRISTIAN BECKSVOORT is a contributing editor to Fine Woodworking and a custom furniture maker in New Gloucester. Maine. CARVED, FLUSH PANELS SEPARATED by a vertical stile add texture to the long, lean look. This combination of styles became the author's favorite door. A FRAME-AND-GLASS-PANEL door turns a storage cabinet Into a display cabinet. Glass provides a view ofthe contents, and three drawers hide behind the solid lower panel. Single Stud, French Cleat Hanger it's a simple matter to press the cabinet against the wall and Rip at 45 after vertical support is tenoned into cleat j„„, „ „,„,„, ,,„ ...,„„.,. 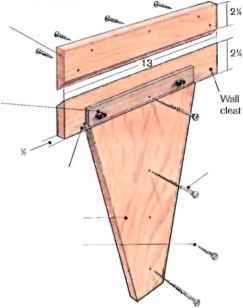 „i„„t :„t_.i„„[,„ ... ,k„ stock to create cabinet-back cleat and wall cleat, slide it down so that the cabinet s cleat interlocks with the wall-hung cleat. Recessing the cabinet back an extra % in. completely hides the hanging system. Normally, the wall cleat spans at least two studs and is anchored in a couple of places. Because my cabinet Is only 14 in. wide. I was able to screw into only one stud. A single screw into the usual narrow wall cleat would allow the cabinet to swivel on the wall but might not offer sufficient support for the cabinet and Its contents. My solution was to make a T-cleat. as shown in the drawing at right. The bottom of the T is tenoned into the wall cleat and extends down the wall another 17 In., providing plenty of extra space for screwing the cleat to a single stud. Be sure to level the cleat when screwing it to the wall. After screwing the top cleat to the cabinet-back frame, the cabinet is ready to drop into place on the wall cleat. As a safety feature. I also add a small brass screw through the panel back into the hanger. ADJUSTABLE SHELVES AND DRAWERS with carved pulls enhance the simple features of the dovetailed carcase. Also shown is the routed finger pull used on the carved, flush panel door. Flat-head brass wood screw (#6 x 1) screwed though cabinet back and into hanger keeps cabinet in position on cleat. Cut rabbet 1 in. wide to accomodate the back and the French cleat. How to make cabinet doors?